Explanation: At Table Mountain Observatory, near Wrightwood California, USA on October 26, wild fires were approaching from the east. But looking toward the west just after sunset, astronomer James Young could still enjoy this comforting view of a young crescent Moon and brilliant Venus through the the fading twilight. Setting over the horizon of Mt. 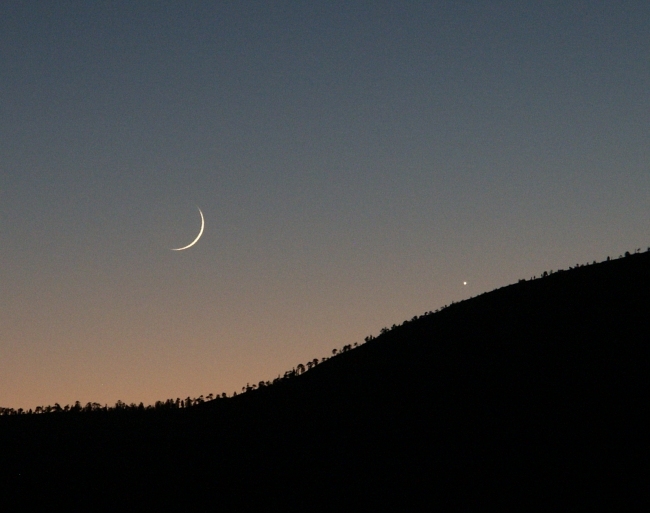 Baden-Powell, the thin crescent was only about 37 hours "old", or 37 hours after its exact New Moon phase. After disappearing from morning twilight in August, Venus was becoming prominent in its role in western skies as the evening star. A similar lovely pairing of thin crescent Moon and stunning evening star can be seen toward the west in today's evening twilight. Happy Holidays and Best Wishes from APOD!